(3 hp), including communication variants for USS, PROFIBUS, PROFINET and EtherNet/IP. Offering high power density in a smaller footprint, the new “tiny drive” offers fully compatible replacement for the equivalent power ratings on the previous version. On new control cabinet designs, the G120C FSAA has significant size advantages, up to 32% less overall volume, for the OEM or integrator, but requires no re-engineering, when migrating from the G120C FSA on current jobs. Overall dimensions on the smaller unit, designed for use with PROFIBUS and USS variants are only 173mm high x 73mm wide x 155mm deep (6.8” x 2.8” x 6.1”). 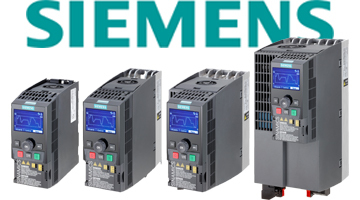 up to 50m (165 ft) for shielded and 150m (495 ft) for unshielded, plus identical voltage ratings, current ratings, load cycles and compatibility with all standard Siemens options such as operator panels, input and output chokes, as well as external Class B EMC filters. The G120C FSAA offers UL open type, IP20 protection in the 0.55–2.2 kW (0.75–3 hp) range. Through the introduction of this new tiny drive, Siemens can now offer machine builders another economical, space-saving and easy-to-operate standard AC drive with a wide range of functions, according to Robert Soré, product marketing manager for general purpose drives at Siemens. Typical applications for this product span a broad machine and equipment range, including smaller test stands, mixers, conveyors, fans, pumps, compressors and basic production machinery.